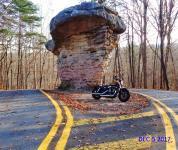 Start the route about 6 miles southeast of Fort Payne, AL where AL Route 35 meet's AL Route 176 (Little River Canyon Pkwy). From there just follow Route 176 south as it heads down to the Canyon and on to the end point at Dog Town. A nice twisty road along the rim of the beautiful Little River Canyon. Challenging, well paved road, winding road with some twisty and sweepers that is a blast to ride! Many scenic pull-off spots with picnic tables and places to get food and gas are available in the surrounding towns. on April 14, 2015 2 out of 2 members found this review useful. on March 19, 2012 2 out of 2 members found this review useful. This is a very nice ride, I did it a year ago and made a fewstops to look over into the canyon. The roads are good and views are awsome. I would recommend if you are in the area to make a point to make this ride. on January 2, 2012 1 out of 1 members found this review useful. What a great ride but not great road surface. This ride has it all, good curves and scenery. I did not notice any services so be sure to stay fueled up. This route has some great water falls. on December 23, 2011 1 out of 1 members found this review useful. What a great ride. Best road on our trip and that includes the Dragon. Beautiful canyon. Your right, a great road. Especially during fall color around the first of November but be careful if you are hard on the throttle, police & forest rangers will pull you over (they are every where) and the speed limit is very slow. Great pavement, winding roads, and views that will have you pulling off to soak them in. I'm not really sure what more you want in a road. There were TONS of bikes out here, and I see why. This is a real gem of a road. on September 26, 2011 0 out of 0 members found this review useful. fun road to ride, other review was correct with the gravel from the in the road from the overlooks. on June 9, 2010 0 out of 0 members found this review useful. road was in good shape and light traffic. had a couple of surprises too, like a rock the road was built around. the only negative was the overlook parking areas were gravel which made it interesting driving on and parking. but all in all a great ride.